We will be partnering with Be Martial Arts and White Cobra Martial Arts for our state tournament this year. Other schools will be welcome as well to compete and have a great day of fun and fellowship! Experience camaraderie among fellow students and schools, test out your forms, defense, weapons, sparring and skills. This is just around the corner – so start your training for competition now! Spectators: First parent/guardian/friend free. $3 for 4 and older or $10 for 4 tickets. 1. 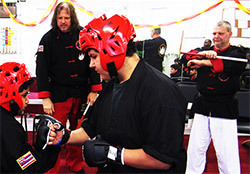 All students will need their own sparring gear to participate in sparring classes starting this month for safety and hygiene. We are phasing out our “gently used” and “not-so-gently used equipment. If you would like to purchase the used helmets and gloves you may do while supply lasts: Sparring Gloves $10. Helmets $15. 3. Personal weapons kept at the school must have your name identity marked clearly on them. Purchase 3 months or more and receive a free uniform. Current students can get store credit. Offer expires June 23! Testing will be on Friday June 29 at 5 p.m. An Awards Ceremony for all to watch will be at 6. Higher level testing will begin earlier that day – be sure to consult your test invitation. 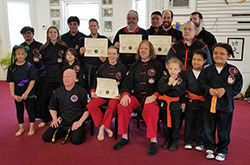 Rising Dragon is now posting all of its training DVDs on an internet site – so when you purchase a ‘Block of Training’ for Kung Fu and Kenpo, Tai Chi, Kickboxing you will have access anywhere, anytime with any mobile device or computer! Costs for video access ranges from $30-$60. Those who have previously bought DVDs should see Sigung and he will hook you up for video access to those. Pay before the 5th of the month to avoid late fees. Credit/Debit cards are accepted. Receive up to 3 months free by purchasing 3, 6, or 12 month packages!